West Waterford's Ronan Mansfield has made the FAI's under 13 emerging talent programme international squad for the Actavo Cup in Dublin. A 12-year-old West Waterford soccer player is feeling proud after being selected for the Republic of Ireland under 13 squad for the upcoming Actavo Cup in Dublin. Cappoquin Railway Football Club's Ronan Mansfield, who has strong Carrick-on-Suir roots, says joining 17 other rising soccer stars on the Football Association of Ireland’s (FAI) under 13 emerging talent programme international team means “everything” to him. Ronan started playing for Cappoquin FC at the age of six, a shining young talent that progressed onto the West Waterford East Cork (WWEC) Development Squad within four years. With WWEC, Ronan gained invaluable experience playing in the Cover Cup 2015 and 2016, the Mare Nostrum Cup 2016 in Spain, the Manchester International Cup 2017, the Kennedy Cup 2018, and the Galway Cup 2017 and 2018. Last year, Ronan was selected to join the South East Emerging Talent Programme, and months later made the cut for the South East Centre of Excellence. Ronan says dedication, hard work, a healthy diet and support from family and friends has helped him progress through the ranks at underage. “We do a lot of tactical training and play a different way with the South East Centre of Excellence here in Waterford. I do a load of different exercises at home and follow a programme that the coaches gave us. Foam rolling, stretching and relaxing keep me on top of my game,” the motivated left-back tells Waterford Live. 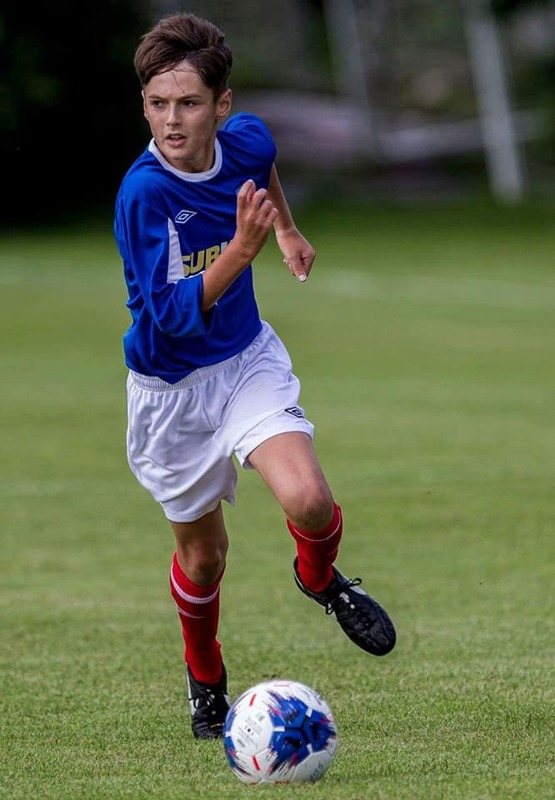 Ronan got called for trials with the FAI under 13 Republic of Ireland Development Squad in March, and in June was selected to train with a squad of 50 Republic of Ireland players over a three week period. Ronan started training with Waterford FC’s under 15 team in recent weeks, having received notification that he will be representing his country at the Actavo Cup in Cherry Orchard, Dublin, from September 14-16. Ronan is relishing competing in a competition which includes teams such as Liverpool, Newcastle United, Glasgow Celtic, Aberdeen and Swansea City. His side will open the tournament against St Patrick’s Athletic on Friday 14th September at 4:30pm, followed by games in Group 2 against Glasgow Celtic and Newcastle United. “It has been a really good few weeks for me and I cannot wait to play against all the big teams in the Actavo Cup. We are training well as a team and it’s great getting to know the other players because we are all from different parts of Ireland. We have a great team and are looking forward to testing ourselves against the best teams. If you said to me when I started playing soccer that I would get the chance to represent Waterford and Ireland, I would have given you one of my fingers for it,” he smiles. Tipperary Town club St Michael's star central defender Conor Martin has also been included in the Ireland squad. Similar to Ronan, Conor started playing with his local club at the age of six before progressing through the ranks. His form with the Tipperary Emerging Talent team warranted a place on the Waterford Regional squad. He overcame the rigourous trials with the FAI under 13 Republic of Ireland Development Squad and is thrilled to be selected to represent Tipperary and Ireland at the Actavo Cup. "Conor is a very good, committed player with a great attitude. For a central defender he is very comfortable on the ball," says St Michael's schoolboy secretary John Cremins. "It's fantastic for a player of his age to get recognised at national level and it's also brilliant for the club. We are very proud of him," he adds.